This should slow down the freezing season in the Chukchi this winter and slow the onset of deep convection in the Labrador sea. Roughly, what is the time it takes for Chuckchi water to reach the Labrador sea? Water that gets subducted into into subsurface layers takes years to do anything in the Arctic ocean. When the oceanographers figure out when that water comes back up I will tell you or you will tell me. The paper did not report on subducted heat resurfacing. So the answer is, I don't know. What's important to us now is that the Chukchi is changing rapidly before our eyes into a mostly ice free region in the arctic. This will affect both the atmosphere and the ocean in years to come and this year well into late fall and early winter. I took another look at the Mercator scales. They were the same. Don't trust the forecasts. Thanks for that animation Aluminium. The time lapse shows something we don't see too often. A flash freeze in the central Beaufort. Usually ice freeze either extends out from the main pack edges or from the continent edges. Here we can see a large freeze in the central Beaufort that was not connected to the main pack. Not sure if this is connected with that patch of old ice in the Beaufort (I thought it had migrated further west) or maybe an area of low salinity water surrounded by slightly higher salinity that froze first ? I attach graphs showing the progress of the Chukchi to an open water sea. @FOoW, agree, mercator forecasts often don't appear to match with last analysis. Even using fixed scale images. A look at FDDs confirms that the season has not started well. Phil, I don't think ice moved quickly enough to do what you think it did. I think that the freezing front propagated quickly along a freshwater layer created by melting ice in the summer months. I think there was clear sky and radiational cooling in the area of freeze up. Without clouds heat is lost rapidly in the in the Arctic darkness. The GFS 2M temperatures forecast shows cold building in Siberia throughout the next week... the open ocean water really seems to be keeping air temperatures in the Arctic Ocean anomalously warm over the same timeframe. My current darling is the warm arctic cold continents scenario, perhaps there is a glimpse into the future based on what emerges. Certainly, there are considerable regions of colder 2M air temperatures over land than over water. But, I didn't come here to point and grunt at the GFS.. I'm wondering if there is an existing WACC index time series? Looking at various troposphere pressure anomalies in the latter half of GFS forecast shows ... I wanna say kaleidoscopic ? is there a better term for this pattern? It's like vortex lows swirling eachother but it breaks into two patterns with one over Siberia, one over CAA/Greenland... Kaleidoscopic I wanna say. Reminds me of a bucket of swirling paint. I believe the sudden growth in the Beaufort/CAB is thanks to the sliver of ice that remained in the Beaufort. That small amount of ice begat more ice very fast, encircling a huge swath of the ocean, giving it the perfect conditions for fast refreeze. Here is an image of the developing ice patch in the Beaufort on Oct 15th. Oriented top north. The main pack is located over 300km to the east - too far away to be break off. I agree it is most likely linked to the plucky patch of old ice. Hey, that's a cool animation, could you extend it to start few days (say 4) days earlier and end in about 4-7 more? Amateur observations of Sea Ice since 2003. Is that a giant jellyfish on the right? Yes, Tor I saw that earlier. Thought it was a bit like a euro symbol. 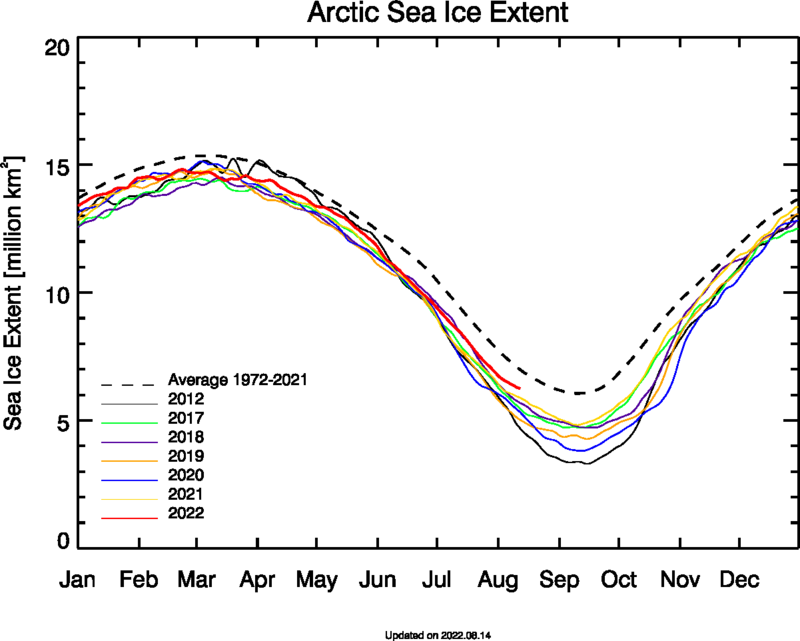 The time of the great loss of 2012 Arctic sea ice, setting the lowest ever sea ice extent spanning months, has come to an end, now past mid-October. The to-date arctic sea ice extent for 2007 is now the lowest extent, & 2007 is soon to be passed by 2016 sea ice low, which was a tremendous comparative downward surge during this period of rapidly gathering Arctic sea ices. It is not coincidental that the 2016 wild DECREASE in sea ice GAIN, occurred when the gap between the satellite average High Arctic temperature & 2016 High Arctic temperature, was at its widest ever ( ~ +20degC) averaged over millions of square kilometers. With all this sea ice... "decrease of the increase", it will be very interesting to see what the to-date sea ice extent of 2018 will bring in these future weeks, since to-date 2018 sea ice extent is rivaling 2012, 2007, & 2016, & a "long term" 2018 High Arctic high temperature is presently reigning. After 4-7 days, of course. I saved single images since June 8. Laptev looks to be in for a bit of heat, especially on the CAB side. We might still see some decent ice growing along the Siberian coast. It's strange alright that ESRL did not pick up on the sudden changes in the more western Beaufort. Here is the NSIDC view on Oct 17th. That Beaufort blob does look remarkable, compared with the image 3 days earlier. to see the beaufort blob and it's origins best to run Worldview from @ 5th Oct .. it is possible to see thru the clouds most days and on the 16th you can see the new ice with the old embedded ..
as for dmi80' .. the high Arctic .. the regional anomaly remains 10'C above normal and/or where it should have been 31 days ago .. and most of the last 23 days have broken daily records . ....the gap to the present "2010's Arctic sea ice" average widening again to 440,000 square kilometers LESS. .....2018 Arctic sea ice is 550,000 square kilometers LESS than the to-date "2010's sea ice average". 2018 now has more to-date sea ice than ONLY the year 2012, which had a spectacular loss of sea ice, much going away due to fortuitous winds that drove ices into the North Atlantic. To-date 2018 Arctic sea ice is 720,000 square kilometers LESS than the to-date "2010's sea ice average". It is not coincidental that the 2016 wild DECREASE in sea ice GAIN, occurred when the gap between the satellite average High Arctic temperature & 2016 High Arctic temperature, was at its widest ever ( ~ +20degC) averaged over millions of square kilometers. Yes indeed! During this time of year when Arctic sea ice rapidly increases, there are very very few short periods of Arctic sea ice DECREASES. Yet, 2016 had two distinct periods of sea ice decrease, both losing periods occurring when 1) High Arctic temperature over millions of square kilometers was 20(+?) degC above average & 2) High Arctic temperature over millions of square kilometers was ~ 16degC above average. As stated previously, 2018 may be setting itself up for a wild decrease in sea ice, if present 2018 High Arctic high temperatures go even higher. We will see what the future temperatures & sea ices will do. There are two major cold fronts that could cool the High Arctic, one from the Canadian archipelago & one from the Greenland Ice Sheet, & a small cold front on High Siberia. So far the High Arctic resists the cold & predictions indicate that the High Arctic should stay warm.....for a while. Great, looking at the patterns of ice growth over all the marginal Seas could be illuminating. To-date 2018 Arctic sea ice is three quarters of a million square kilometers LESS than the to-date "2010's sea ice average". That new ice is very thin. The NSIDC resolution may be exaggerating the change a little. Indeed, have a look at SMOS data. Ice thickness calculation resumed after the melting pause. Bremen has 2018 lowest for this date. Is there a resource that catalogues the Northeast Passage opening and closing dates? Is this year a record long open? The SMOS data are concerning. The thickest ice continues to decline to record low amounts. That means we are at a record low ice volume for the date, by a good margin, if SMOS is correct. The PIOMAS mid month update showed 2018 volume above 2012 and pretty much tied with the other contenders for low volume, so there is apparently modest disagreement in volume estimates. Most likely that's because PIOMAS has more volume this year in the greater than 1m thick region in the central Arctic basin. Fossil fuel emissions from Asia and Europe may be cutting down the life expectancy of Arctic clouds, reducing the clouds’ ability to regulate temperatures in the polar region, according to new research. A new study published in Geophysical Research Letters, a journal of the American Geophysical Union, suggests pollution plumes coming predominately from Northeast Asia and Northern Europe travel to the Arctic region and allow cloud droplets to freeze at higher temperatures. This phenomenon triggers earlier than normal snowfall and can reduce the clouds’ lifetime, according to the new research. The shorter the clouds live, the less they are able to regulate temperatures at the surface, the study’s authors said. 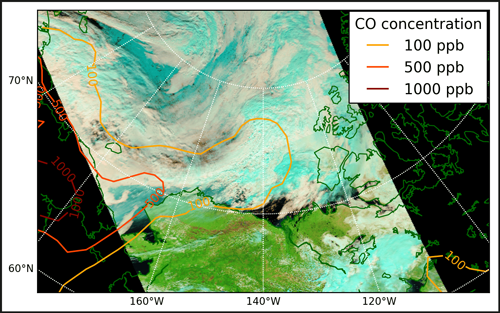 Previous research conducted by Coopman and his colleagues showed Arctic cloud properties are extremely sensitive to pollution. They found clouds in the Arctic were two to eight times more sensitive to air pollution than clouds at other latitudes. The new study’s results suggest pollution plumes lower the amount of cooling needed for cloud droplets to freeze by about 4 degrees Celsius (7.2 degrees Fahrenheit), a much stronger impact than expected, Coopman said. This means cloud droplets can freeze at higher temperatures. When cloud droplets freeze more readily, snowfall occurs sooner, which can decrease the clouds’ lifetimes and inhibits their ability to regulate temperatures at the surface, according to the study’s authors. The new study did not examine how much this change in cloud formation is affecting surface temperatures but the study’s authors said previous work suggests a reduction of cloud lifetime would have an overall cooling effect on the surface and a warming effect in the upper atmosphere. Reduced precipitation rates allow pollution within air parcels from midlatitudes to reach the Arctic without being scavenged. We use satellite and tracer transport model data sets to evaluate the degree of supercooling required for 50% of a chosen ensemble of low‐level clouds to be in the ice phase for a given meteorological regime. Our results suggest that smaller cloud droplet effective radii are related to higher required amounts of supercooling but that, overall, pollution plumes from fossil fuel combustion lower the degree of supercooling that is required for freezing by approximately 4 °C. The relationship between anthropogenic plumes and the freezing transition temperature from liquid to ice remains to be explained. Anthropogenic pollution plumes from midlatitudes can be transported long distances to the Arctic. In this study, we analyze the impact of these plumes on how easily liquid clouds over the Arctic Ocean freeze by using a novel combination of satellite measurements and a pollution transport model. We find that liquid clouds in polluted air switch phase to become ice clouds at temperatures that are 4 °C higher they would otherwise in pristine air. Because ice clouds in the Arctic precipitate more easily than liquid clouds, the potential is that distant industrial pollution sources are acting to reduce arctic cloud life time. Noticing that the DMI 80N temp (sorry A-Team) has been hovering vaguely around -10º C, I wonder if the observed (reported on these threads) 'sea water functionally doesn't freeze until the air reaches -10' meme is related (heat of formation and all that physical chemistry stuff that I don't know anything about). Couldn't resist comparing SMOS and 0m salinity. I used to be more agile with my animations, but can you or anyone compare SMOS to PIOMAS (from Wipneus' animation) for Oct 15th? If it's technically possible. Much is said about the "heat wave" in the High Arctic. But, the entire continent of Asia is warm too, with only very small areas of any coolness. The Asian heat slides into Europe & even continues south, over the islands of the Pacific & to Australia. Thanks as always for this animation. The good news is that first signs of actual freezing have finally appeared as offshoots from the pack on the Atlantic front, and even on the Laptev front. Better late than never. in the long range forecast, (this is all the way out to November 4th) GFS expects increased Arctic heat anomalies. climate reanalyzer shows up to +5.8C in the Arctic zone. really pronounced warm Arctic with two colder regions on land. this is bigger than October of 2016 in terms of DMI 80N. 10mb center starts to move towards greenland as well. I have a vague memory that there was a study that suggested temps had to drop below -10 celsius for sea ice to form in the Arctic ocean. This has been repeated so often that it seems to have become the generally accepted conventional wisdom. I have my doubts. I can see no reason why in a calm sea, and with the sea having lost most of its accumulated summer heat, ice cannot form at air temperatures a bit below -1.8. There is ice forming here and there on the Arctic fringes, and I doubt everywhere is at -10 or below. I am expecting to be shot down. But is the proof out there? Yeah. During September a lot of the focus here has been on the warmth coming up from the ATL and PAC fronts (and justifiably so) but this autumn the CAB is further compromised by very warm record breaking heat from Asia. A favoured path was warmth from the chukchi running right across the top of Russia then turning right bringing further heat over the pole. The Russian snow cover has been slow too and coupled with the very large open sea area in the Laptev the DMI N80 will struggle for a considerable time yet. The Russian snow is beginning to develop now and there are small signs of ice developing along the north Russian coast, but it is going to take a few weeks yet before the warm Laptev is sealed off. The Russian scientist Vladamir Vize ( the island was called after him ) was the Godfather of ice formation. There is a rather scary looking picture of him here on Wiki ! Maybe earlier in the season temps close to -10 are needed to get things going but nilas will form with air temps at -7. Wayne's assertion that you must have hace -1.8C water and -11C surface temperatures is scientifically wrong. By thermodynamics, the water, the interface, and the air immediate to it must be at the same temperature. The other is alternative facts, or fake science, as bad as those that some deniers use to push fanatically or ignorantly or both their arguments. Let’s keep respect to 200-year-old established science at least, even when current scientific work may not be all well established yet. Another thing is the 2m temperatures that the weather forecast may provide which may substantially be lower. But I doubt that the -10C threshold sustained for days as a rule of thumb is correct, except in specific conditions. Certainly the 80N temp DMI is no indicator of anything of the Arctic proper in general. The ice thickness increases at a rate roughly proportional to the square root of the cumulative FDD. Formulas such as this are empirical, meaning they are calculated only with observed data, so they really are simplifications of the ice growth processes. The formulas assume that the ice growth occurs in calm water and is reasonably consistent, and they do not take into account sea ice motion, snow cover, and other surface conditions. Snow cover is one factor that dramatically alters the actual sea ice thickness calculated from the above formula. Snow is an effective insulator, slowing the transfer of heat from the ocean, through the ice, and to the atmosphere. Snow essentially slows the growth of ice. CFDD of 3.6±11.2◦C, is required for ice formation in the Northern Caspian. Cumulative FDDs look much more like it (and of course any remaining ocean heat and upwelling etc etc etc). How come we only have FDDs for North of 80? An FDD series for individual seas would seem to be a somewhat useful tool. .... a study that suggested temps had to drop below -10 celsius for sea ice to form in the Arctic ocean. This has been repeated so often that it seems to have become the generally accepted conventional wisdom. I have my doubts. "During this time of year when Arctic sea ice rapidly increases, there are very very few short periods of Arctic sea ice DECREASES. Yet, 2016 had two distinct periods of sea ice decrease, both losing periods occurring when 1) High Arctic temperature over millions of square kilometers was 20(+?) degC above average & 2) High Arctic temperature over millions of square kilometers was ~ 16degC above average." My recollection is that it was the result of Wayne's own observations, he lives somewhere up in the Archipelago? The ice thickness growth formula needs some surface ice to work with, surface ice will start to form once a stable density gradient is set up so there will be a delay while that occurs. My guess is that the observation of the -10ºC is related to a heat transfer effect, bigger deltaT faster heat transfer. Page created in 0.059 seconds with 28 queries.